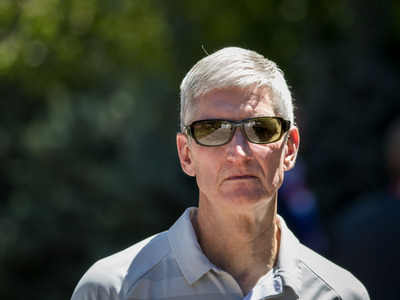 Drew Angerer/Getty ImagesApple CEO Tim Cook. Apple shares slid after CNBC reported the hedge fund billionaire David Einhorn sold his stake amid trade-war concerns. Apple shares were down more than 3% following the report before paring their losses. Watch Apple trade here in real time. 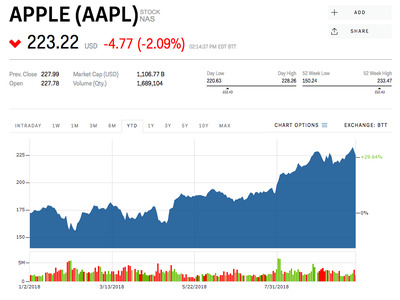 Apple shares dropped Friday afternoon after CNBC reported the hedge fund billionaire David Einhorn told clients in an investor letter that he sold the stock amid concerns of an escalating trade war between the US and China. After selling 77% of its stake last quarter, Greenlight sold the remaining stake on August 31 for $US228 worth $US40 million, CNBC reported. Apple shares was down as much as 3.2% following the news before paring their losses. The announcement comes one day after Bloomberg reported Chinese spies implanted tiny chips in some of the company’s server motherboards that ended up being sold to firms including Amazon and Apple. The goal was reportedly to use the microchips to gain access to sensitive corporate data and other secrets through advanced hacking. Apple issued an unequivocal denial to the Bloomberg report. In a statement released Thursday afternoon, Apple said the company had never found any “malicious chips” or vulnerabilities in “any server” and denied having any contact with the “FBI or any other agency about such an incident” – directly contradicting several key claims in the report. Apple shares were up 29% this year.